My decision to skip NUE race #7 The Fools Gold and transfer my entry to Sue Haywood, so that she could have a hard race to get ready for Shenandoah, turned out to be a good one. After two miserable rainy 100 mile races at Cohutta and Mohican, I really didn’t want to endure another 100 mile mud-fest. It’s not that I don’t like racing in mud, because I actually do, but replacing bearings, cables and brake pads after every race gets expensive. As bad luck would have it, horrible conditions for The Fools Gold forced a shortened race. Specifically, the gritty crystalline structure known as fools gold has an unusually abrasive effect on brake pads when muddy racing conditions spread it around. With 14,000 feet of fast descending, the racers had no brakes after 30 miles or so… In hind sight, no thanks. 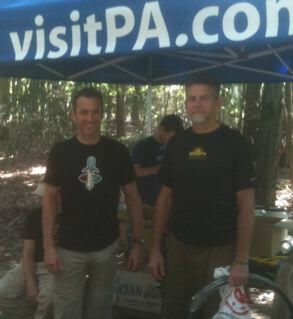 I instead joined 29er Crew teammates Chris Beck and Travis Saeler, stayed in town and raced the Mid Atlantic Super Series Rattling Creek MTB Marathon in Weiser State Forest. Like Sue, I was looking for a long hard effort to prepare for the Shenandoah Mountain 100 early September. Since my 2010 results have been lacking and I was looking for a win, I opted for my geared Superfly and the Masters 45+ division rather than duking it out with what looked to be a pretty competitive Single Speed category. We stage at the bottom of a hill on a short road section. I line up next to 2009 NUE Masters Series champion John Williams who rides for Bike Line. I also see Mike Laub in the 2nd row on the other side of the road. Since we’re doing a mass-start, other than John and Mike, I have no idea who the 22 other registered Masters racers are. Bang! we’re off on the short road section before a long three mile double-track climb to the top of the ridge. Since this is a mass-start with 100 riders and there’s a gate at the beginning of the double-track climb that forces riders down to single file, I gunned it on the road. I was through the gate in 5th place. Mission accomplished. Ahead of me was at least Beck and PaValleys.com riders Brandon Draugelis and Rob Lictenwalner. We stayed tight for a short while, but I needed to settle down a bit for the climb and so I let the leaders slip away. 3 or 4 riders went by and I did not chase. I glance back and see the line of 90 followers. After ten minutes of climbing I’m passed by eventual single speed winner Mark the Elk Elsasser. He’s running what looks like 32×18 which is a huge gear for the climb we’re on. Elk is known for being hard on equipment and I’m sure is considered to be his sponsor’s (Independent Fabrications) most valuable rider because of his extreme product testing ability. He just breaks stuff… kind of a lot. I’m thinking Mark is going to be tough in two weeks at SM100 with legs like that! After another 10 minutes, I’m caught and passed by my good friend Jed Prentice, a Bike Doctor rider who turned pro last year. We’re close to the top of the climb, so I gas it a little to stay with Jed. We stay together on the road section after the climb but once in the single track, Jed gets around a guy who I think is moving at a fine pace and he’s gone. The Rattling 50 is mostly single track and the single track that’s there ranges from medium rocky to full-on rock gardens. There’s nothing buff about this race which is why it’s so fun. If you’re good in rocky single-track, you’re going to do well at the Rattling 50. Since there’s really only the one major climb in the very beginning of the race, I fully expect to be caught and passed a few more times by riders who’s technical rock riding skills outweigh their climbing ability. About 15 minutes into single track, I stab-n-dab a couple of the nastier rock gardens and I notice the rider behind me is voicing words of encouragement. It’s Trek Mountain Coop rider Jon the Poz Posner. Wow, he’s made it up the climb in good time and this boy and ride the rocks. I let him go by because I know he can crush it on the nasty stuff. We ride together for awhile till he drops me after one of my more major goof-ups. The ride to CP1 is relatively uneventful. A couple more riders get by but I’m holding my own somewhere between 10th and 15th overall. I stop at CP1 to fill a bottle and notice super strong single speeder Dan Bonara working on his bike with a mechanic from the aid station. As I’m filling, two riders go right on by including Mike Laub. I jump on that train not wanting to loose the wheel of Laub. Mike stops for some unknown reason and lets me by. I say hello but don’t ask any questions. Two other geared riders catch us over the next mile or two. We change positions a few times through the rock gardens but end up riding together in the rocky single track. On the climbs, I try to get clear and do but end up being caught by tall skinny single speeder Tim Dickson from Guy’s Racing. Tim has a Ti Moots with a Carbon Lefty fork… very gucci setup. Tim and I ride together for a long while on the fire roads. He’s dropping me on the climbs and I pass him on the flats and downhills. Because I’m a single speed racer sometimes too, I don’t try to drop him when I’m ahead. We were riding so long together, I asked him the standard single speeder question: What gear you running? 30×18 was the answer. Eventually he gets tired on one of the climbs and I pass. Shortly after that, I catch back up with Elk. Since I helped the 2nd place single speeder nearly catch up with Elk, I try to help Elk in the same way by offering a wheel in the faster sections… gotta keep it fair. It works till we get to the non-checkpoint aid station between CP1 and CP2. I ride right through and suddenly our group is smaller. The new smaller train eventually jumps back into single track and passes Poz on the side of the trail eating some food. He jumps on. I again let him by …hey I might learn something! I ride probably the best I do all day on the wheel of Poz… It certainly was the most fun, till we hit a double track section. Everybody kindof sits up. I take that as my queue to hit the gas and to try to form a gap that might stick. It is a race after all and in racing, all alliances are temporary. 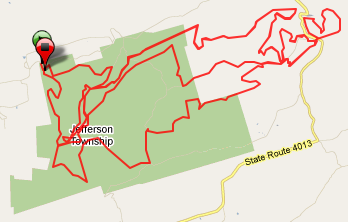 Riding alone, I blow through CP3 and do the 4 mile loop solo. I fill another bottle at CP4 and ride the last 15 miles alone. I try to keep the effort high, but it’s difficult with nobody around. The last 15 miles are the first 15 miles backwards. So the first climb becomes a long fast descent to the finish. I cross the line just under 5 hours. Good enough for first place in Masters, my first win of the year! John Williams comes across the line 4 minutes later running with his bike having flatted on the final descent… yikes! I didn’t see him all day, but he must have been pretty close before the flat. Nice riding John! Talking with the normally strong Mike Laub afterwards, he said tire problems kept him from riding as fast as he could have. In the men’s open, Branden Draugelis led with Chris Beck on his wheel all day until Branden got away very near the end. Chris crossed the line and everyone told him that he was the winner! Apparently Brandon somehow got off-course shortly after the separation. While it would have been great to see a real finish-line shootout with these two titans, I’m psyched my rock star teammate Chris Beck was able to win the overall with a time of 4:08. Wow, that’s fast! Les Leach, Dustin Manotti, Rob Lichtenwalner and Jed Prentice all crossed the line within 10 minutes of each other starting at 4:28 to round out the top-5. 29er Crew teammate Travis Saeler just missed the open podium by 1 minute in 6th. Elk crossed at 5:03 to win the single speed followed by Tim Dickson in 2nd at 5:07. Staying true-to-form, Elk showed me two broken spokes on his rear wheel. Travis Coldsmith, Chris Fallon, Nick Mccormick and Nate big air Shearer rounded out single speed 3rd through 6th all crossing within 1:40 of each other…. pretty close after 5 hours of racing. Super kid Dan Bonara apparently led the single speed for a good while before bending his surly stainless steel chainring which led to the lengthly repair at CP1. I noticed the bent chainring was being worn as jewelry during the post-race feast. 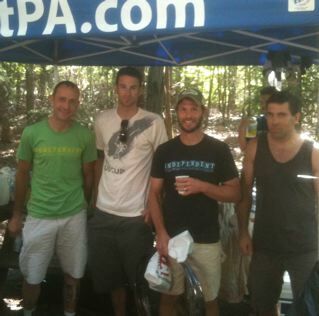 Big thanks to Mike Kuhn, Zach Adams and all of the race volunteers for putting together a great race and making the 2010 Rattling 50 a success. 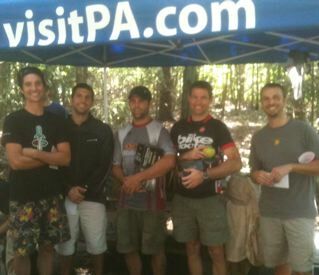 It was a good day for 29er Crew with Chris Beck and I winning our respective categories. I’m surprised there weren’t more people there. There aren’t that many long races in the mid-atlantic and this is a really good one. It’s a solid technical course that has well supported aid stations. With complimentary food and beer available afterwards, It’s definitely on my todo list for 2011. This entry was posted on August 26, 2010 at 9:33 pm and is filed under Must do Races. You can follow any responses to this entry through the RSS 2.0 feed. You can leave a response, or trackback from your own site. sweet race report! I am in such a painful fog the whole time during those things…I don’t know how you remember such detail. Thanks for the compliments, but I have to say, one of my highlights during the race was riding on your wheel in some of the tricky stuff – the rider ahead of you got jammed up – and I remember you pulling this ice dancing ballet move with a pause in the middle, something straight out of the dictionary under “graceful riding,” and get yourself from all kinked up to straightened back out in a blink – that was awesome. Congrats on the 2010 victory! See you at SM100. You’ve really stepped it up a notch this year… quite a feat as a new dad. I think you’re ready for Shenandoah. See you and the rest of your clan this weekend.